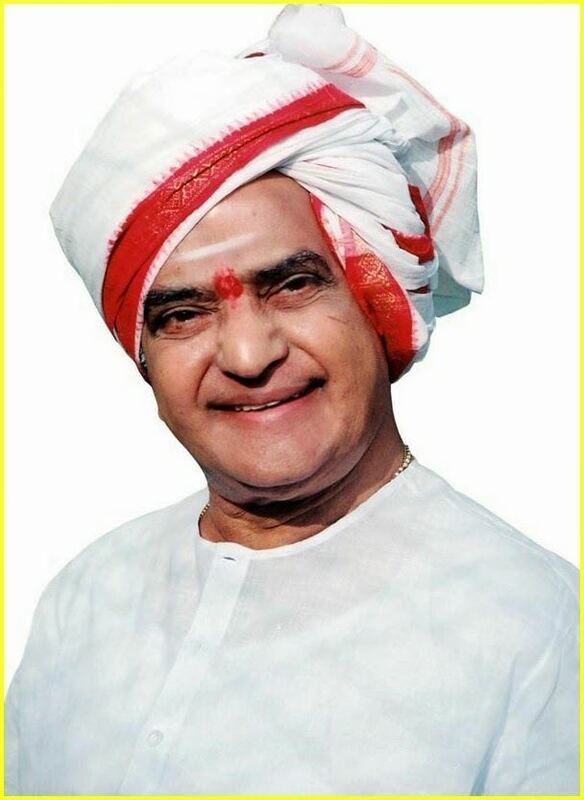 Nandamuri Taraka Rama Rao (28 May 1923 – 18 January 1996), popularly known as NTR, was an Indian actor, filmmaker, director, editor and politician who served as Chief Minister of Andhra Pradesh for seven years over three terms. He is a cultural icon of the Telugu states and is popularly called as "Anna". He received three National Film Awards for co-producing Thodu Dongalu (1954) and Seetharama Kalyanam (1960) under National Art Theater, Madras, and directing Varakatnam (1970), NTR has received the erstwhile Rashtrapati Awards for his performance(s) in the films Raju Peda (1954), and Lava Kusa (1963). He garnered the Nandi Award for Best Actor for Kodalu Diddina Kapuram in 1970, and the Inaugural Filmfare Award for Best Actor – Telugu in 1972 for Badi Panthulu. NTR made his debut as an actor in a Telugu social film, Mana Desam, directed by L. V. Prasad in 1949. He gained popularity in the 1950s when he became well known for his portrayals of Hindu deities, especially Krishna and Rama, roles which have made him a "messiah of the masses". He later became known for portraying antagonistic characters and Robin Hood-esque hero characters in films. In total he starred in 300 films, and has become one of the most prominent figures in the history of Telugu cinema. He was voted 'Greatest Indian Actor of All Time' in a CNN-IBN national poll conducted in 2013 on the occasion of the Centenary of Indian Cinema. He starred in such films as Patala Bhairavi (1951), which premiered at the first India International Film Festival, held in Mumbai on 24 January 1952, Malliswari (1951), premiered at Asia Pacific Film Festival, the enduring classics Mayabazar (1957), and Nartanasala (1963), featured at Afro Asian film festival in Jakarta. All the four films were included in CNN-IBN's list of hundred greatest Indian films of all time. He co-produced, Ummadi Kutumbam nominated by Film Federation of India as one of its entries to the 1968 Moscow Film Festival. Besides Telugu, he has also acted in a few Tamil films. 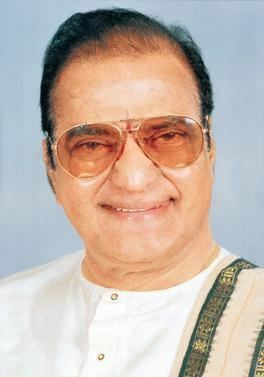 Widely recognised for his portrayal of mythological characters, NTR was one of the leading method actors of Indian cinema, He was referred to in the media as Viswa Vikhyatha Nata Sarvabhouma. He was awarded the Padma Shri by the Government of India in 1968, recognizing his contribution to Indian cinema. N. T. Rama rao (NTR) was born on 28 May 1923 in Nimmakuru, a small village in Gudivada taluk of Krishna District, which was a part of the erstwhile Madras Presidency of British India. He was born to a farming couple, Nandamuri Lakshmaih and Venkata Ramamma, but was given in adoption to his paternal uncle. He attended school at first in his village, and later in Vijayawada. After his matriculation in 1940, he studied at SRR & CVR college in Vijayawada and at the Andhra-Christian College in Guntur. In 1947, he joined the Madras Service Commission as a sub-registrar, a much-coveted job that he nevertheless quit within three weeks to devote himself to acting. He developed a baritone singing voice as a young man. NTR started his film career with a walk-on role as a policeman in Mana Desam (1949). Following this, he appeared in Palletoori Pilla, directed by B. A. Subba Rao. His first mythological film was in 1957, where he portrayed Krishna in the blockbuster film Maya Bazaar. He essayed the role of Krishna in 17 films, including some landmark films like Sri Krishnarjuna Yudham (1962), the Tamil film Karnan (1964) and Daana Veera Soora Karna (1977). He was also Known for his portrayal of Lord Rama, essaying that role in films like Lava Kusha (1963), and Shri Ramanjaneya Yuddham (1974) to name a few. He has also portrayed other characters from the Ramayana, such as Ravana in Bhookailas (1958) and Seetharama Kalyanam (1961) among others. He portrayed Lord Vishnu in films like Sri Venkateswara Mahatyam (1960) among others and Lord Shiva in Dakshayagnam (1962) and Uma Chandi Gowri Sankarula Katha films. He has also enacted the roles of Mahabharatha characters, such as Bheeshma, Arjuna, Karna and Duryodhana. Later in his career, he stopped playing the role of a prince in his commercial films and began to play roles of a poor yet heroic young man fighting against the existing system. These films appealed to the sentiments of the common man. Some of these films are Devudu Chesina Manushulu (1973), Adavi Ramudu (1977), Driver Ramudu (1979), Vetagadu (1979), Sardar Papa Rayudu (1980), Kondaveeti Simham (1981), Justice Chowdhary (1982) and Bobbili Puli (1982). He also portrayed fantasy roles, his notable film in that genre being Yamagola (1977). His film Lava Kusa, in which he starred as Rama, collected 10 million rupees in 1963. He directed and acted in the hagiographical film Shrimad Virat Veerabrahmendra Swami Charitra (1984). He also acted in films like Brahmasri Viswamitra (1991) and Major Chandrakanth (1993). His last film was Srinatha Kavi Sarvabhowmudu, a biopic on the Telugu poet Srinatha which released in 1993. In the later half of his career, NTR became a screenwriter. Despite having no formal training in scriptwriting, he authored several screenplays for his own movies as well as for other producers. He also produced many of his films as well as other actor's films through his film production house National Art Theatre Private Limited, Madras and later Ramakrishna Studios, Hyderabad. He actively campaigned for the construction of a large number of cinemas through this production house. He was influential in designing and implementing a financial system that funded the production and distribution of movies. He was so dedicated to his profession that he would often learn new things in order to portray a particular character on-screen perfectly and realistically. At the age of 40, he learnt dance from the renowned Kuchipudi dancer Vempati Chinna Satyam for his role in the film Nartanasala (1963). NTR entered politics when he founded the Telugu Desam Party (TDP) on 29 March 1982 in Hyderabad. He said that this decision was based on a historic need to rid Andhra Pradesh of the corrupt and inept rule of the Indian National Congress which had governed the state since its formation in 1956 and whose leadership had changed the Chief Minister five times in five years. In the elections, the TDP allied with the Sanjaya Vichara Manch party and decided to field educated candidates who had a good name in the society and were not indulging in corruption, which was an innovative political concept at the time. NTR himself decided to contest from two assembly constituencies, Gudivada and Tirupati. NTR used many innovative ways of campaigning, such as being the first politician in India to use rath yatras for campaigning. However, it was MGR who had started the open-top van campaigning for elections, as it was felt that he can address the roadshows as an alternative to the mammoth meetings, which involves large amount of money as well as manpower. For this, he used a modified Chevrolet van which was given the name of Chaitanya Ratham. In this, NTR travelled across the state of Andhra Pradesh, criss-crossing all the districts. With his son Nandamuri Harikrishna, also a film actor, driving the van, NTR notched up over 75,000 kilometres during his campaign, a distinctive sight with the van's yellow party flags and banners and NTR sitting on top of the vehicle hailing the crowds. 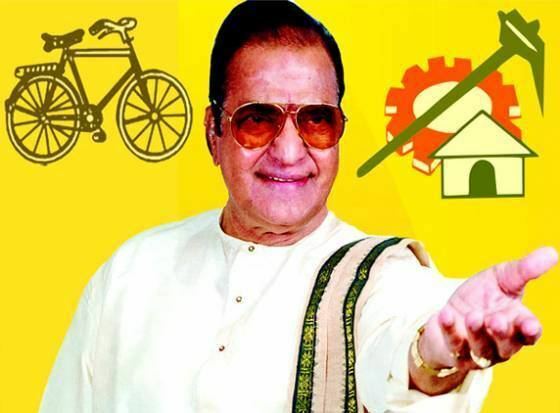 NTR campaigned for restoring the dignity of the Telugu people and advocated the forming a closer bond between the government and the common people, going into the elections with the slogan, Telugu Vari Atma Gauravam (lit. Telugu people's self-respect). On 15 August 1984, NTR was removed from office by the then Governor of Andhra Pradesh Ramlal while he was in the USA to undergo open heart surgery. His finance minister, Nadendla Bhaskara Rao, a former Congressman who joined the TDP during its inception, was made the Chief Minister by Ramlal. Bhaskar Rao purportedly had the support of majority of the TDP MLAs which was never the case. NTR returned to India immediately after his surgery, disputed the claims by Bhaskara Rao and demonstrated his strength by bringing all the MLAs supporting him, which was a majority in the 294 member assembly, to the Raj Bhavan (Governor's Office). Ramlal did not relent, as a result of which NTR relaunched his Chaitanya Ratham campaign, this time campaigning for the restoration of democracy by mobilizing the support of people and various anti-Congress political parties in the country including the Janata Party (JP), the Bharatiya Janata Party (BJP), the Left Front, the Dravida Munnetra Kazhagam (DMK), and the National Conference (NC). During the one-month crisis, the MLAs supporting NTR were secured in a secret place to avoid horse-trading. Due to mobilization of several political parties and the people and due to press, Indira Gandhi, unwillingly removed Governor Ramlal and appointed a Congress veteran, Shankar Dayal Sharma, as the governor of Andhra Pradesh to pave the way for restoring NTR. Shankar Dayal Sharma removed Bhaskara Rao from power and restored NTR as the Chief Minister of Andhra Pradesh in September 1984. A month later, Indira Gandhi was assassinated and was succeeded as prime minister by her son, Rajiv Gandhi. In the ensuing national elections to the Lok Sabha, the Congress, riding on the sympathy wave caused by Gandhi's assassination, won convincingly all over the country except in Andhra Pradesh where the TDP secured a landslide victory. TDP achieved the rare distinction of becoming the first regional party to become the main opposition party in the Lok Sabha. Meanwhile, in the state, NTR recommended dissolution of the Assembly and called for fresh elections the following year in the state the following year to ensure the people had a fresh choice to elect their representatives. The TDP again won with a massive majority in those elections, with NTR winning from 3 seats; Hindupur, Nalgonda and Gudivada, thus marking the beginning of his second term as Chief Minister. Senior Leaders of the Congress in the state including former Chief Ministers Kasu Brahmananda Reddy and Kotla Vijaya Bhaskara Reddy lost in their constituencies of Narasaraopet and Kurnool respectively to the TDP. NTR completed his five-year term as Chief Minister. In 1984, when the then Chief Minister of Tamil Nadu and fellow actor M. G. Ramachandran (MGR) was unable to campaign in the state elections due to his being hospitalised in the USA. NTR, who was a close friend of MGR, campaigned for his party, the 'All India Anna Dravida Munnetra Kazhagam (AIADMK), despite the fact that party was an ally of the Congress at the time. As leader of the National Front, he campaigned extensively for the constituent parties when they faced elections, again using his Chaitanya Ratham campaigning concept. In the December 1989 assembly elections however, he was voted out of power due to a wave of anti-incumbency sweeping the state as a result of which the Congress returned to power. 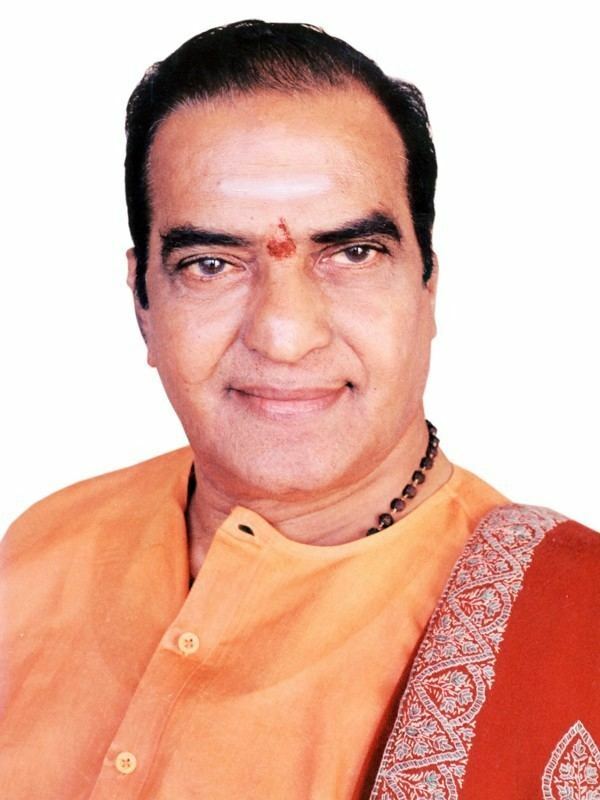 NTR himself lost from Kalwakurthy by a narrow margin to the Congress, but retained the Hindupur assembly seat. During this time, he suffered a mild stroke, as a result of which he was unable to campaign, which, according to some political analysts and TDP supporters, was the reason for the TDP's loss. During 1989, he established himself in national politics, forming a coalition of non-Congress parties opposed to the Congress known as the National Front. It included parties, besides the TDP, such as the Janata Dal, the DMK, the Asom Gana Parishad (AGP) and the Indian Congress (Socialist). This alliance governed India between 1989 and 1990 with support from the Left Front and the BJP. Meanwhile, NTR assumed the position as the Leader of Opposition in the state. His National Front government at the centre led by V. P. Singh was at the forefront of social justice by implementing the provisions in the Mandal Commission for providing 27% reservation for Other Backward Classes (OBC's). NTR returned to power for a third and final time in the December 1994 state assembly elections with his party in alliance with the Left Front. This alliance won 250 seats in the 294 seat Assembly, with the TDP alone winning 226. The Congress, which once again had multiple Chief Ministers in the state during its five-year rule between 1989 and 1994, won only 26 seats. NTR contested again from Hindupur and won the seat for the third consecutive time, achieving a rare hat-trick of wins from the same assembly constituency. He also won from another assembly constituency, Tekkali. On 23 August 1995, after nine months into his third tenure, he was removed as Chief Minister and as the president of the TDP by his son-in-law, Nara Chandrababu Naidu, who engineered an internal party coup against him and took over the offices. Naidu claimed that the reason for overthrowing NTR was that the latter was planning to hand over the reins of the party to his second wife Lakshmi Parvathi and felt that the party was in danger of disintegrating under her rule. Most of the TDP MLA's sided with Naidu and camped at the Viceroy Hotel in Hyderabad, the centre of the revolt. NTR's sons Nandamuri Harikrishna, Nandamuri Balakrishna and his other son-in-law Daggubati Venkateswara Rao played a crucial role in the coup but all of them fell out with Naidu soon afterwards. The reason for this is that Naidu is said have promised to make Venkateswara Rao the Deputy Chief Minister and Harikrishna the party's general secretary, but he sidelined all of them soon after becoming the Chief Minister and Party President. In an emotional interview after the coup, NTR called the coup a planned treachery and lambasted Naidu for being power-hungry and untrustworthy, likening him to Aurangzeb, the Mughal Emperor who jailed his father and killed his siblings to become the King of the Mughal Empire. In May 1943, at the age of 20, while still pursuing his Intermediate, NTR married Basava Tarakam, the daughter of his maternal uncle. The couple had eight sons and four daughters. His eldest son, Nandamuri Ramakrishna Sr., died in 1962, soon after NTR completed shooting of the film Dakshayagnam. NTR founded the film studio Ramakrishna Studios in Nacharam in his memory. His fourth son, Nandamuri Harikrishna, is a child actor-turned-politician elected to the Rajya Sabha, representing the TDP. Harikrishna's sons Nandamuri Kalyan Ram and Jr. NTR are also actors in the Telugu film industry (Tollywood), with the latter being one of the top actors in the industry today. His sixth son, Nandamuri Balakrishna is one of the leading actors in Tollywood from the mid-1980s. He also started his career as a child artist. Balakrishna has contested 2014 assembly elections as a TDP candidate. He won the Hindupur Assembly Constituency. His seventh son, Nandamuri Ramakrishna Jr. is a film producer. His third son, Nandamuri Saikrishna, who was a theatre owner, died in 2004 following diabetic complications. The other sons Jayakrishna and Mohanakrishna are noted cinematographers. Mohanakrishna's son Taraka Ratna is also a Tollywood actor. NTR's second daughter, Daggubati Purandeswari has represented the Indian National Congress in the Lok Sabha and was a Union Minister. She shifted her allegiance to the Bharatiya Janata Party. Basava Tarakam died of cancer in 1985. 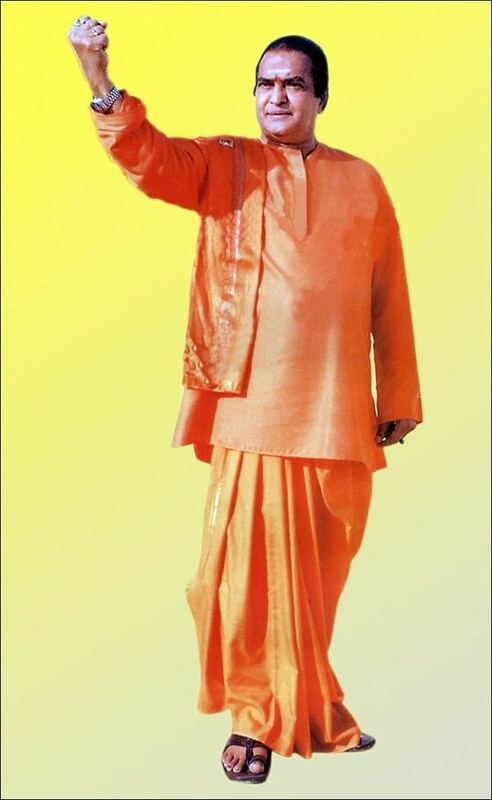 In her memory, NTR established the Basavatarakam Indo-American Cancer Hospital in Hyderabad in 1986. In 1993, NTR married Lakshmi Parvathi, a Telugu writer. She was the author of his 2-volume biography of NTR, published in 2004. The first volume 'Eduruleni Manishi' deals with his younger days and the film career. The second volume, 'Telugu Tejam' deals with his political career. The NTR National Award is a national award in honour of NTR. It was instituted in 1996 by the Government of Andhra Pradesh to recognise notable film personalities for their lifetime achievements and contributions to the Indian film industry. The NTR National Literary Award was instituted by the NTR Vignan Trust, as an annual award to recognise people for their lifetime achievements and contributions to Indian literature. Dr. N.T.R. University of Health Sciences was established as University of Health Sciences by the government of Andhra Pradesh and was inaugurated on 9 April by N. T. Rama Rao, the then Chief Minister of Andhra Pradesh in the city of Vijayawada, Andhra Pradesh, India. It started functioning on 1 November 1986. After the death of Rama Rao, it was decided to rename the University after him, and this was carried out on 2 February 1998. The university celebrated its silver jubilee from 1–3 November 2011. 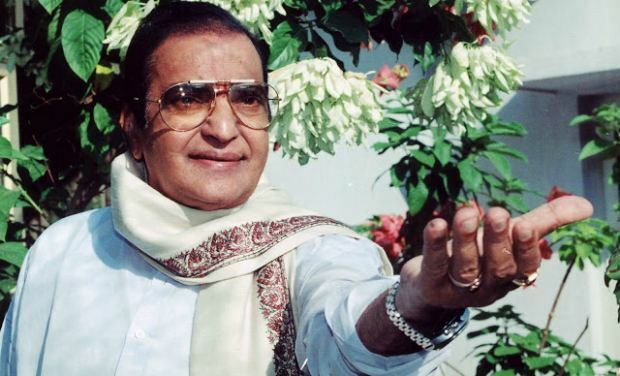 NTR died of a heart attack on 18 January 1996 at his residence in Hyderabad, aged 72. He was cremated and his ashes were immersed at Srirangapatna by his second wife eight years later, in 2004.